Whether you are a wildlife enthusiast or love the tranquil surrounds of the water, all can be enjoyed from this 3000+ sqft residence intelligently sited atop a 1+ acre creekfront bluff on the southern end of Bald Eagle Lane. Enter into a home alive with light from generous window pkg and impressive fenestration. Spacious living area and gourmet kitchen flow into the sizeable screened creekfront deck, creating a grand outdoor bonus room perfect for entertaining during Wilmington’s famed ocean cooled evenings. Just a wedge shot across the creek lies picturesque views of the #9 & #10 greens of Eagle Point Golf Club. Attention to detail and materials are found throughout this custom home lending a nod to true craftsmanship. Additional features: craftroom, home office, 2nd level family room. For more information including photographs and current pricing, click here. 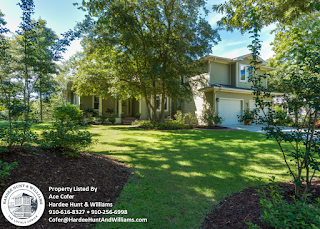 To schedule your private tour of 8021 Bald Eagle Lane, please contact Hardee Hunt & Williams at 910-256-6998 today.